Following ArtHamptons, Gallery Sam (CA) will be exhibiting Neuman’s work at artMRKT Hamptons. Previously, Gallery Sam has also shown Neuman’s work at artMRKT San Francisco, held this past May. 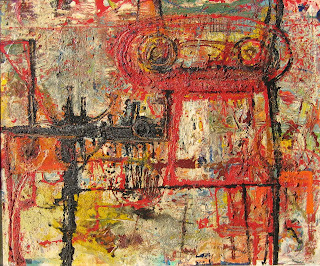 Gallery Sam will be exhibiting two of Neuman’s earliest works, Summer of the Dead and Angry Dog (image). Both pieces were completed in Oakland, CA, after Neuman earned his MFA at the California College of Arts & Crafts. The panels were also exhibited at the Los Angeles County Art Fair (1953), Denver Art Museum (1953), and Pennsylvania Academy of Fine Arts (1953), marking Neuman’s early foray into abstract expressionism and his rapid acceptance into the abstract art scene.